Quattroemme Consulting has inherited the tradition of what has been achieved over the years by Quattroemme, an IT services company founded in 1987. Quattroemme was born with a clear focus and preference for using Lotus technology, which in the ’80s and’ 90s developed software to make useful applications for Groupware purposes. 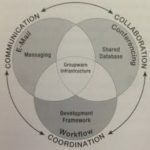 Groupware was a new approach to team working that envisaged the implementation of tools for Communication – Collaboration – Coordination, the famous 3C’s that defined the new working methods. Quattroemme has received many awards at the EMEA for this specialization in Lotus technology. With a view to expanding its skills, over the years it has established close partnerships with other major vendors in the market: Adobe, Microsoft, Qlik. Origins – Since the year of its birth in 1987, Quattroemme has focused its activities on the themes of Groupware, meeting the need of organizations to improve and promote collaboration between people and the sharing of information, in order to optimize communication processes to make them more efficient and competitive. 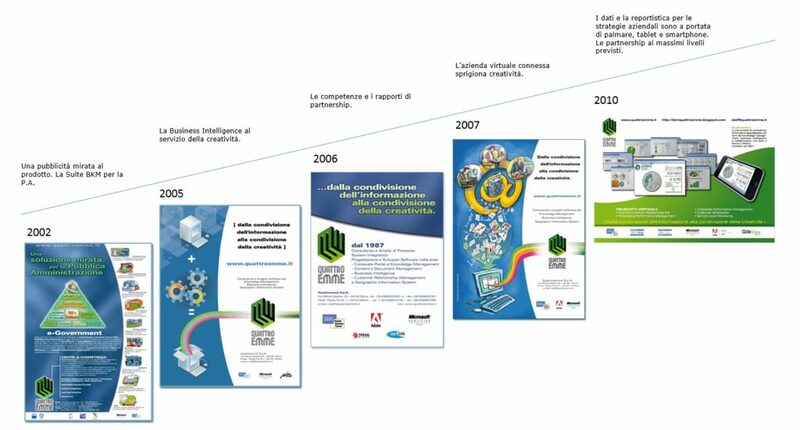 From Groupware to e-Business – In the second half of the 1990s, Quattroemme began a process of expanding its skills and offers by developing solutions aimed at improving the services offered by companies towards the external Customer (Customer Relationship Management) and the internal Customer (Employee Relationship Management). 1 – Analytical approach. Our side data analysis has developed Business Intelligence applications for the reclassification and reprocessing of company data to support management decisions (Data Warehouse, Data Mining, Executive Information System), while data localization has developed Geo-marketing applications in the field of GIS (Geographic Information System) that are particularly effective solutions to improve and increase corporate business. Moreover, the combination of the experiences in the two areas has allowed Quattroemme to produce cutting-edge solutions in the field of Logistics and Distribution at a national level. 2 – Methodological approach. Quattroemme has applied its experience in Business Process Management projects, aimed at increasing the overall efficiency of the processes involved in the business, through the monitoring of real-time processes, the automation of workflows and the integration of enterprise applications. (Enterprise Application Integration). Knowledge Management – In line with the need to reengineer the company communication processes and with the tendency to relocate activities, organizations have felt the need for a new structure, namely “the virtual company”, parallel to the physical company that is a place of entry, meeting and exchanging, in which it is possible to realize the conditions to promote organizational and business objectives (Knowledge Management topics). Based on these needs Quattroemme has developed an approach called Business Knowledge Management, aimed at building information systems for Data Management and Business Knowledge. The Quattroemme Consulting logo tells a good story. A story of passion and enthusiasm. It tells the story of a man who chose to be an entrepreneur and who in technology has always seen an instrument as a service for people and organizations. The company that he wished for, envisaged and created deals with technology as if it were not just made of technicalities. It is careful to enhance and put at the forefront all the “soft” aspects that impact on the development of organizational and personal skills. 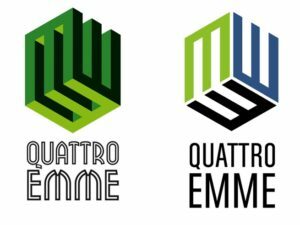 Firstly, the Quattroemme logo represents the choice to create a brand that has an emotional bond through the initials of its founder, Maurizio Masotti and the members of his family. Secondly, it shows the desire to portray and convey the meaning of the company’s activity. The M’s create a cube that is a symbol of solidity, stability and containment. In the IT world such a symbol can remind people of a database, within which the data is contained and processed. Such data, that if properly managed, can create business knowledge from which creativity blossoms (db, big data, repository, data mining analysis). Quattroemme Consulting, not wanting to distort, but to enhance this tradition, has also wanted to add another meaning, consistent with the current activities of the company, providing a different and broader perspective. The cube can provide a felling of stability, it can be seen as closed like a data processor or alternatively it can be seen as open as if you could see inside it. The chromatic choice, which always refers to the style of Quattroemme, facilitates the possibility of seeing it according to the double angle. The message we want to convey is the projection towards all that is innovation. Stability, experience and the guarantee of skills are all implicit and they are strengthened and acquired through a mutual exchange with the environment and the reference context. What is “external” (data and relationships) to the company becomes a resource (open innovation). Open Innovation da Wikipedia: Open Innovation from Wikipedia: “Open innovation is a paradigm that states that companies can and must resort to external ideas, as well as internal ones, and access internal and external markets if they want to progress in their technological skills. »(Henry Chesbrough, 2006). • Streamlining and optimizing business processes. • Collecting, processing and managing of all the information that when perfectly combined can help with the definition of company strategies and business development. In this sense, technology becomes the tool to enable organizations to share and create business knowledge, triggering the virtuous circle that leads to its diffusion at all levels of the company, including participation and collaboration (Knowledge Management). Creativity helps to increase the value of organizations, because it distinguishes them from the others in a unique way. Such creativity belongs to all of the people who are part of these organizations, while emanating from the individual. By making ideas available as well as experiences and know-how, people become a part of a process of co-creating original and innovative solutions. Such solutions can only be enhanced towards everyone’s common goal through the progress and work of the organization. Such a goal represents the ability to compete and acquire positions of value in a market that is increasingly difficult to conquer. In the slogan, concepts such as communication, collaboration, sharing, openness, dialogue and fundamental elements for group work are implied and emphasized. Some advertising pages of Quattroemme, published in specialized magazines or focused on digital issues.